Last year my fiancée (now wife) and I decided that we wanted a nice actual sharp sword for a wedding gift. We placed an order with Vladimir Cervenka of the Czech Republic ( http://www.sword.cz/ ) in October 2014. We opted for a custom composite design, combining the pommel and quillons of a ~1580 South German riding sword (Catalogue No. 2000218, a very common design in Bavaria and Austria, cf. also: http://myArmoury.com/albums/photo/866.html ) with the shell guard and ring hilt elements of a ~1590-1610 German made sword (Catalogue No. 2000221, original seen here: http://myArmoury.com/albums/photo/774.html ). We did not want the sword to be artificially antiqued and no etchings on the blade, but the shell guards are ribbed and the quillons and pommel are engraved. The grip is wrapped with wires from different metals. Contrary to rumours, we were asked if we wanted the sword blunt for fencing or sharp. Vladimir usually responded very timely to e-mails and was very forthcoming with additional pictures of his previous work to provide inspiration. Due to (serious) illness and other unfortunate factors delivery took until late July instead of February or March. Partly to make up for that delay (which was non-critical to us) Vladimir took the extra time to add decorative embossings to the baldric and scabbard we ordered with the sword. 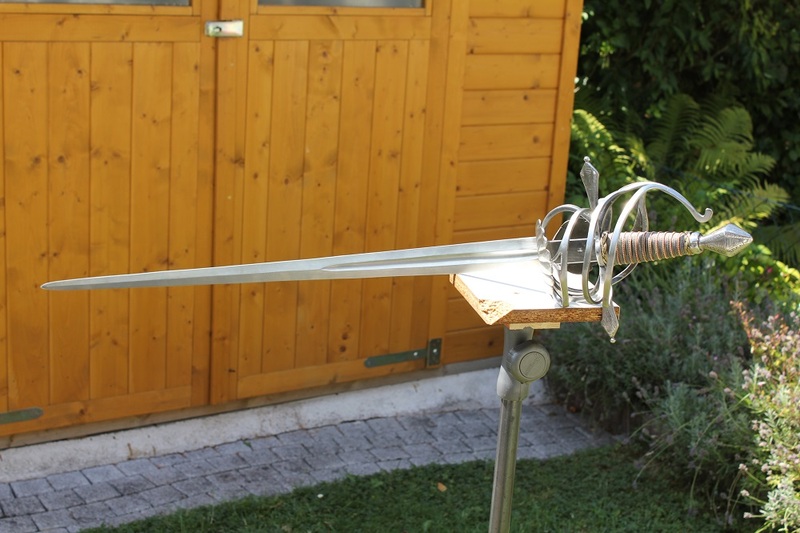 Shipping was handled via GLS, the sword was sent on Friday and arrived the following Tuesday (Czech Republic to Germany). Material: CSN 14 260 spring steel (DIN 54SiCr6) at 50-52 HRC. Profile taper: ca. 4 cm at the base, ca. 2.8 cm at the end of the fuller, ca. 1.3 cm near the point. Distal taper: 7mm in the ricasso, 5.5mm at the start of the fuller, 5mm at the end of the fuller (on the ridge), 3.8mm at forward vibrational node, 1.8mm near the point. The sword feels very lively in the hand. The weight on paper is not as light as expected, but the great point of balance combined with the finger grip makes it feel very responsive and agile in the hand. The pronounced distal taper combined with the profile taper certainly help as well. The blade flexes very nicely, but is rigid enough to deliver solid cuts and thrusts. Sharpness out of the box is solid. Not quite knife-sharp, but still paper-cutting sharp and enough to make short work of 1.5 and 3 litre plastic bottles (a lot harder than milk jugs) if the cut is executed properly. Thrusts go through the bottles as if they weren't there. I did touch it up with a whetstone after the first round of cutting and achieved a somewhat sharper edge than it originally had. As it is not an extremely hard blade it takes an edge easily, but may need to be sharpened a bit more frequently than, say, a 1095 high carbon steel blade at 56-58 HRC. The forte is not sharpened at all until the end of the fullers and has a 1.2mm thick edge. The sword is rock solid. Nothing wiggles or has any undue play. The blade overall has a somewhat matte finish with some soft ripples from grinding. The fuller and ridge are straight and consistent. The hilt has a rather rough finish to it. The inside of the shells is left black. In many places it has a sandpaper-finished look and here and there you can see grindmarks. What I like best about it, however, is that there are plenty of traces of the forging process where it was deliberately not polished to perfection. The insides of the rings and bars are cleaned up, but still proudly demonstrate their hammered finish. Joins in the basket seem to be forge-welded for the most part. The pommel and quillons are engraved with sort-of-floral patterns commonly found on originals of that shape. The engravings are, again, not perfect, straight and symmetrical, but have a very pleasant and characteristic look to them. The pommel is also extremely smooth to the touch, much more so than one would expect with the engravings. The grip itself is bound with twisted wires, but surprisingly pleasant to the hand even without gloves. The combination of three different colors and structures of wire (probably brass, bronze and some silvery metal) makes it absolutely gorgeous. It shows the same characteristics described in earlier reviews of his work. The baldric and scabbard are well made and the extra decorations are a very nice touch. What I found particularly nice about it is the seam at the back, which is not a standing ridge, as I had seen on other, cheaper all-leather scabbards, but a very nice and even flush fit that is sewn together very cleanly. The blade is solidly held in the scabbard by friction of the forte against the leather, meaning that the cutting edge does not generally rub against the leather as the scabbard is a little wider than the blade in the forward half. We are very happy with the sword. It might have taken longer than expected to arrive, but it is nevertheless exactly what we were hoping for, and at a reasonable price. It has plenty of character and was well made to our desires. Now here's hoping that it will be a family piece in the future. Not my favorite style/era, and yet I like this one a lot. Combination of wire and visibly 'hand made' engravings looks stunning. This forum probably needs a "like" button: everyone's watching, and only few are commenting . A great work, if you ask me. even though not my favourite style. May I also ask what was the price? I sent you a PM about the price, as Vladimir does not publicly disclose his prices but readily provides a comprehensive list upon inquiry. I'm not going to write it here, but I think it's fine via PM. Johannes, thank you for the review. That looks like a fine sword. I really like that sword and thanks for the review. I received a new Cervenka sword in early April this year (~1580 cavalry sword) and I agree with your review whole-heartedly. Vladimir is an excellent chap to deal with and makes very attractive swords. I also like his leather work. Nice work. I have three of Vladimir's swords, and a couple of daggers. He's easy to deal with, and keeps his word. Great review. I am pressing the like button. Like button pressed. Very good looking piece. I ordered an antiqued Viking sword from Vladimir last year and I heartily concur with the other posters' favorable comments about him. My sword is terrific and Vladimir was a pleasure to deal with. I cannot recommend him highly enough.